If you thought the Acer gaming laptop was a beast you are going to enjoy the new Razer Project Valerie three display laptop which has been unveiled at CES 2017 this week. 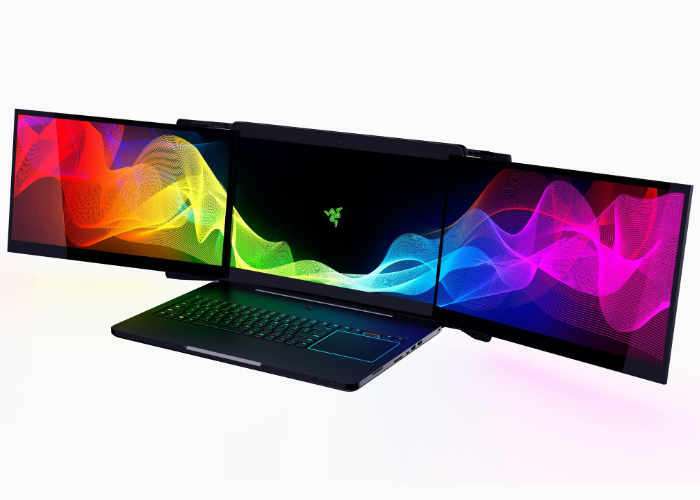 The new Razer Project Valerie laptop is equipped with three high resolution 17.3 inch 4K screens providing the most expansive viewing experience of any laptop to date. Check out the video below to learn more about its design and construction and the unique automated way the screens unfold. The displays are powered by a NVIDIA GeForce GTX 1080 graphics card and offer a massive resolution of 11520 x 2160 pixels for users to enjoy, perfect for enjoying Elite Dangerous while away from your desktop setup. The Valerie laptop measures 1.5 inches thick and weighs less than 12 pounds, unfortunately no information on pricing or worldwide availability has been released as yet, but as soon as information comes to light we will keep you updated as always. Razer explains more abut their very unique three screen gaming laptop. Immersive gaming has never been more portable. Introducing Project Valerie, the world’s first automated triple display laptop. Constructed to be incredibly powerful yet mobile, this revolutionary laptop gives you easy access to three eye-popping 4K displays. Regardless of where you are, you can have the visual superiority of a 12K desktop setup to excel at both work and play. The 12K multi-display gives you the expansive workspace and flexibility to tackle any task. Utilize the three displays as one to span your creative projects across the large screen real estate. Alternatively, take advantage of each display independently, running multiple applications simultaneously allowing for multi-tasking like never before. Without compromising on style or performance, Project Valerie is engineered with an automated deployment system utilizing highly durable aluminum hinges. This allows the two side displays to quickly deploy and lock into place ensuring the perfect alignment in a matter of seconds. While providing you with three truly stunning displays, Project Valerie stays incredibly portable with a form factor that is comparable to other 17 inch gaming laptops which only provide a single display. The compact chassis fits in your laptop bag so you can have a triple display desktop experience anywhere, anytime.